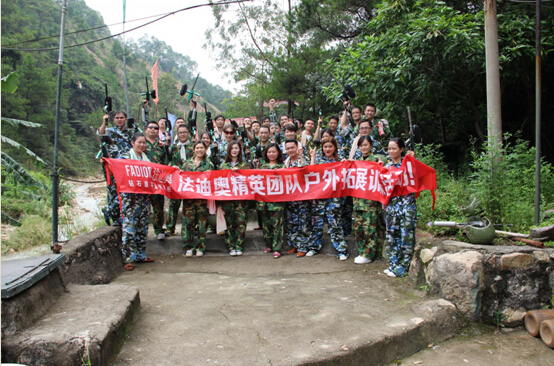 To improve teamwork, August 16th, 2014, Fadior organized the sales staff to participate in "Concise, casting elite" outdoor training program. On 16th morning, Fadior officially opened outdoor development training. The activity take the "concise, casting elite" as the theme, training team members of solidarity, trust, cooperation, enterprising spirit, set up a "real CS field" outreach activities, such as drift boat race multiple projects. The orchestration of the departments of old and new employees are divided into two teams, team cooperation with various departments, through the generated, display, integrated team, for the staff to strengthen the understanding and communication ability, improve the excellent team spirit, colleagues learning in practice, the change in learning experience, well, have more life feeling. Realized team growing in a coordinated, unified command, effective control and effective implementation for the importance of efficient to achieve team goals; Realized the importance of team work to overcome the objective obstacles; Realize the special value of each member of the team. In experiencing the success of the dedication, collaboration, the courage to bring joy, everyone felt profoundly the essence of "team in harmony", as well as a member of the team have to bear the responsibility. Billowing in the end of the training activities, each new and old employees are summed up their own ideas, everyone speak actively, share in summary, the name of the meaning of the event and how to apply the spirit to work. Training is short, but each new and old employee was impressed revelation, understanding, trust and communication among members, team collaboration, reasonable plan as a whole, surpass us! Everyone take part in some of the new and old employees have achieved breakthrough on mental and physical. Believe in the future work to create new achievements! Fadior Stainless Steel Kitchen Cabinets in future development, will be people-oriented, to take care about the employee's work life into details and feet, continuously carry out rich and colorful knowledge skills training and staff cultural activities, constantly training, exercise and building staff team spirit, dedication, innovative spirit, to further enhance the centripetal force and cohesion of the enterprise, promote enterprise healthy and rapid development. Fadior Attends 2014 Canton Fair!